The number of people who died in the collapse of a school in Haiti has risen to at least 88, with another 150 injured, officials say. 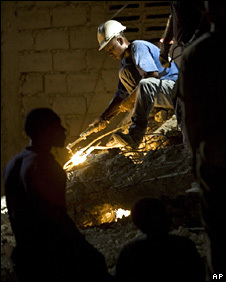 Rescuers worked through the night under floodlights to find survivors in the remains of the three-storey La Promesse College in a suburb of Port-au-Prince. About 500 children and teachers were inside the building when it collapsed on Friday. The owner of the school has been arrested, police say. President Rene Preval said it was "devastating to see such a disaster". "It really breaks your heart to see those children under the debris without being able to help them," he said while visiting the scene early on Saturday. Mr Preval said rescue crews had dropped water and biscuits through holes in the rubble to a group of children and focused their efforts on reaching them. "Last night, we were sure there were still seven children alive. We got one of them but we have lost all signs of the other six being alive," he added. "Some say they might be sleeping. Others believe they have died." President Preval later told the Associated Press news agency that he believed poor construction methods, including a failure to use reinforced steel, had been to blame for the building's collapse. Other buildings throughout Haiti were at a similar risk because of such poor methods and a lack of government oversight, he warned. Fortin Augustin, the preacher who owns and built La Promesse College, has been arrested, though it was not clear whether or not he had been charged. As Mr Preval was inspecting the remains of the church-run school in the suburb of Petionville on Saturday, rescue workers told him that they had found the bodies of 16 students and a teacher inside a classroom. The site contains a kindergarten as well as a primary and secondary school and it is thought there about 500 children inside the building when the first floor caved in. As many as 700 children were enrolled at the school. Engineers from the UN mission in Haiti, Minustah, and members of the Haitian Red Cross are also at the scene, helping the local teams remove heavy pieces of concrete. 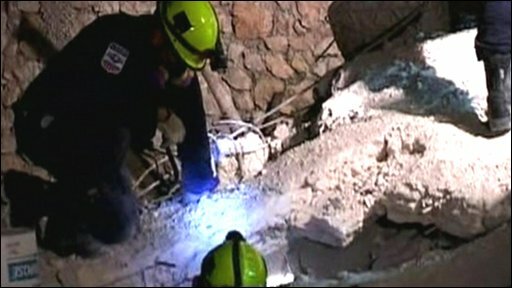 Some rescuers have been digging with their bare hands. Relatives gathered around the school, crying and screaming and searching for their children. "I have four kids in this school and I have not found any of them," said one woman. One man, Nicholas, said he heard a crash and thought it could be the school. "When I got there I saw all the kids getting pulled out. But I didn't see mine," he said. UN peacekeepers and local police have meanwhile been deployed to hold back the crowds of onlookers and the desperate relatives of those missing, who have hampered the arrival of heavy machinery and extra rescuers. 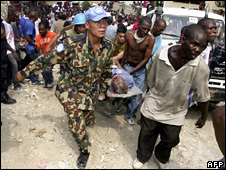 A spokesperson for the UN in Haiti, Sophie de la Combe, told the BBC that the UN and other agencies were trying to save as many people as they could. Ms de la Combe said the remains of the building also had to be reinforced to ensure the rescue effort was effective and safe. "It was continuing to collapse," she said. Specialist rescue teams from the French islands of Guadeloupe and Martinique, and the US are on their way to Haiti to help. Correspondents say Haiti is the poorest nation in the western hemisphere where mudslides and poor construction are commonplace.